Castle Combe Circuit is extremely pleased to confirm the attendance of a Porsche 917 at its 2018 instalment of the Autumn Classic race meeting, set to be held on Saturday, 6 October. Undoubtedly an incredibly special guest for any event, the Gulf-liveried ’69 917K (chassis #013/034) owned by Mark Finburgh represents a very rare competition model that’s usually right up at the top of the list when it comes to many petrolheads’ dream car garages. The announcement falls in-line with the race meeting’s theme of celebrating Le Mans icons this year, with an array of Ford GT40s also attending to commemorate the car’s infamous 1968 outright win at the French endurance race. Only around 59 to 65 917s were ever thought to have been produced, and of them, there were plenty of major variations to match different race series which the cars seemed to continually dominate in. 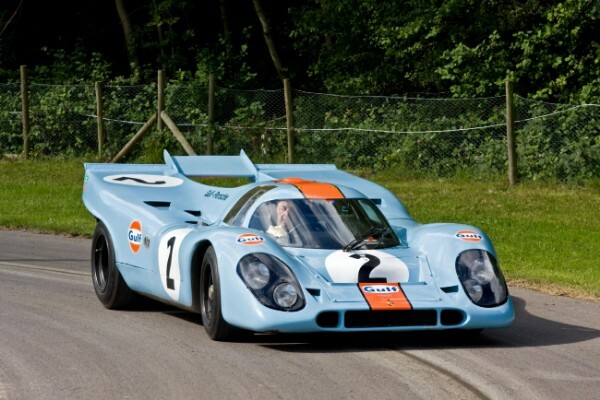 Finburgh’s flat-12, Gulf-liveried beauty carries the ‘917K’ moniker (meaning ‘kurzheck’, or ‘short-tail’) – an adaptation carried out by John Wyer Engineering just one year after the car was conceived in an attempt to quash the image of infamously unstable handling they developed for themselves early on. It’s fair to say this particular 917’s life was colourful and varied from the very start, with a fourth-place finish at Sebring and a Le Mans campaign all under its belt before 1970 was out. In fact, it was also the very machine to star in Steve McQueen’s Le Mans film that same year, too. Sustaining damage caused by an accident during the recording of its aforementioned Hollywood debut, #013 was then sent back to Porsche for a comprehensive overhaul, where its chassis number was changed to #034 – the car being referred to as ‘#013/034’ ever since. 1971 became arguably the most successful year for the car as it took home gold at the Daytona 24 Hours and Monza 1000km races under the control of Pedro Rodriguez and Jackie Oliver. Oliver next teamed up with Richard Attwood to take two other victories that year, before a certain Mr Derek Bell and Gijs van Lennep won the Paris 1000km and finished second in Barcelona. It was in ’73 when current owner Mark Finburgh headed to Stuttgart to purchase a used 917, returning to Britain in this very car. Keeping the 12-cylinder beauty in pristine condition since, Autumn Classic event organisers are delighted to have secured the car for the day. Castle Combe Circuit’s Autumn Classic brings together legs of seven acclaimed historic race series to offer up non-stop competitive action at the Wiltshire venue. There will also be an array of static displays and club stands that’re sure to delight any classic car enthusiast.